Remembrance Day is coming up sooner than we all realize. 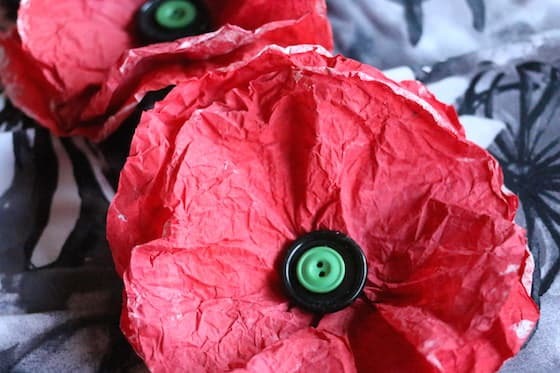 to commemorate this day, I thought it would be fun to create some poppies with my children to help us remember the cruel and hard times that our soldiers had to face through the war. Begin by protecting your work surface with a plastic tablecloth or newspaper. Once you have all your supplies on the table, begin by grabbing the coffee filters. You’ll need between 2-3 per flower. Then, paint your coffee filters, completely covering one side of the filter with red paint. Dry your coffee filters with a hairdryer (hanging them works, but also takes longer). Your coffee filters will be quite flimsy when wet, but just pick one up, and cup it in your hand (painted side UP), and direct the warm air of the hair dryer into the palm of your hand. Holding it this way will prevent your coffee filter from flying away when you blast it with the dryer. Next, crumple the dry, painted coffee filters into tight, little balls. After you crumple them up uncrumple them so they’re somewhat smooth but still wrinkly. Layer 2 or 3 coffee filters loosely together, and pinch the centre-back of the filters together, giving a little twist to hold bind them together. Once done glue the bottoms onto the front of the poppy.